As FirstDown PlayBook progresses through the sprint out pass game install there are some similarities as you move from formation to formation. It’s just natural that when you cut down half of the field and your passing game begins to be two man combinations that they will inevitably be similar. The great thing about sprinting out when you have your three core eligibles inside and in position to protect to the strong or the weak side is that it gives you a little more versatility. Now on the snap of the ball you can sprint your quarterback out to the strong or the weak side and still have your two man route combinations to either side. Depending on your maturity and skill level of your offense, quarterback and receivers you can even package the sprint out strong and weak, in some cases to attack a certain coverage or defender. 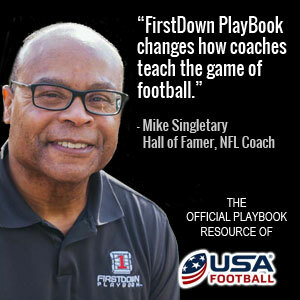 FirstDown PlayBook looks at this a little deeper today with our short video and we also explain how we are so very close to having every single football play in FirstDown PlayBook drawn in color for you. Just in time for the new 2.0 Draw & Edit tool when it is in your hands this January. You are signed up aren’t you?